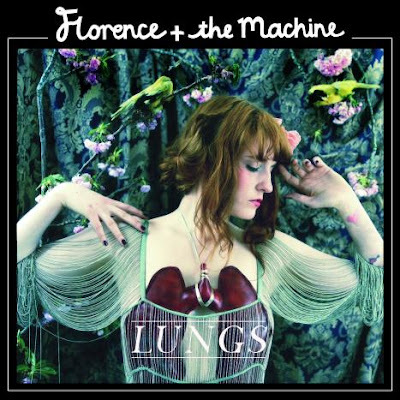 In anticipation of tonight's sold out Florence and the Machine concert at the Enmore Theatre, I thought I might do a short review on last year's debut album, Lungs. All I can say is "WOW". Ok, maybe a little more than that... it really did take me by surprise. This LP by pop-rock artist, Florence Welch, really is hard to define in terms of genre. It's kind of a combination of rock and epic soul music, maybe a bit of pop too. Her vocals are absolutely amazing and has incorporated a wide range of beats and instruments from pianos to harps to heavy drums. Wait, her vocals deserve a couple sentences to them selves. Maybe even a couple of paragraphs. While "the Machine", her band, provides the eclectic backing sound, the voice box on this chick is awe inspiring. No matter what instruments she is singing to, her voice takes over the song at all the right moments. It's truely a special talent and people are realising this including Florence taking home Best Breakthrough Act at the 2009 UK Festival Awards and also winning the best album award at this year's BRIT awards. My musical taste generally hangs in the hip hop and rock departments but I first heard Florence on Triple J's live at the wireless. I heard You've got the love, and Dog Days Are Over and figured they'd be the only tracks I'd like on the album but gladly I was wrong. This album rocks. It's going to be hard to back this album up well with her next try. I hope she does though. You might have heard this before but check out "You've got the love"
It's hard to choose but this is possibly my fave track at the moment, "Cosmic Love"